On this blog, I usually write about the origins of words. Today, I want to write about the origins of symbols, because sometimes words utterly fail us. I think this has been the case following the terrorist attacks in Paris this past Friday. Jean Jullien, “Peace for Paris,” Nov. 13, 2015, Twitter. Where did this symbol come from? As Jullien has articulated in subsequent interviews, the symbol’s power rests in its simplicity: he joins an iconic symbol of Paris, the Eiffel Tower, with an iconic symbol of peace. From a few mere but inspired strokes, one man’s “very raw, spontaneous reaction” evoked universal solidarity. And where did the peace symbol (or sign) come from? 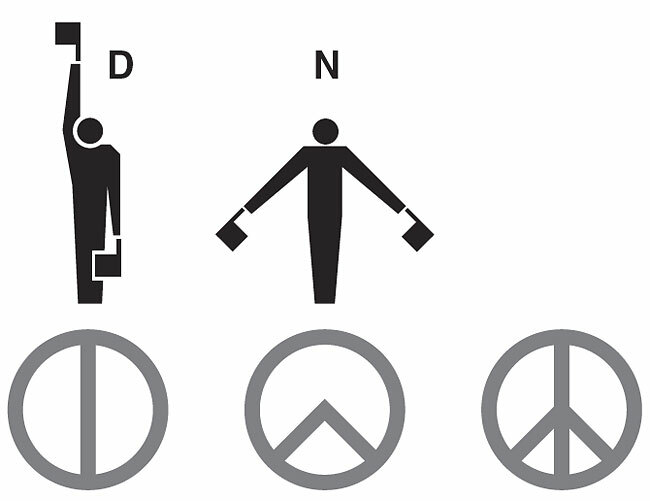 Designer and activist Gerald Holtom created the symbol in April 1958 as part of the nuclear disarmament movement in England. It debuted in a protest march from London to Aldermaston, where nuclear weapons are still being maintained today. The Campaign for Nuclear Disarmament officially adopted the image for its mission and, following coverage of the protests, it travelled abroad and became a symbol for other causes, particularly as promoted by antiwar protests in the US. The are several layers to its meaning. According to Ken Kolsbun’s Peace: The Biography of a Symbol, Holtom superimposed the flag semaphores for letters N (for “nuclear”) and D (for “disarmament”) inside a circle, which represented Earth. Semaphore signs for for D and N. Image from The New York Times. Francisco Goya, The Third of May 1808, 1814, oil on canvas, Museo del Prado, Madrid. Image courtesy of Wikimedia Commons. The focal peasant actually has his arms raised up in surrender, but Holtom’s point is clear. Curiously, Goya’s painting depicts Spanish resistance in the Napoleonic Wars, during which the French forces developed the semaphore systems believed to have originated the modern signals for Holtom’s N and D.
As we’re sadly already seeing with Jullien’s symbol, Holtom’s symbol has not been without controversy. Opponents to protestors who’ve emblazoned their mission with the symbol have variously attempted to link it to paganism (the footprint of a witch or crow) or Satanism (an inverted cross with broken arms). Even today the symbol is lampooned as a “chicken footprint” in an association of pacifism with cowardice. Holtom’s and Jullien’s images have yet more in common: Neither are trademarked, and deliberately so. Created as idiosyncratic expressions of two individuals’ feelings, they speak – freely, in more ways than one – to more fundamental and transcendent human sentiments. As reported in Peace News, Holtom wished his symbol was inverted, suggesting a more hopeful position with the forked lifted raised up and out. His original image prevailed. But while we don’t associate Holtom’s symbol with despair in spite of its origin story, Jullien’s take on it has certainly cast away any lingering doubts. For now, those central lines of the peace symbol stand tall as the Eiffel Tower over the city of Paris, over the world – the great heights of love and light, of strength and solidarity, unshakeable. How were the “pyramids” built? I had read that the Peace symbol uses a “rune” that they inverted and added a circle… which they author of that insight said actually produces the opposite effect. For that rune meant “Protection” and inverted and enclosed in a circle changed its meaning….. just a viewpoint that stuck in my mind…. Personally, I do not find the symbol attractive so I do not use it. But all symbols used hold the energy of the “intended use” and of “collected intentions”…. You’re welcome! Yes, I also came across the rune theory, but, from what I’ve read, the likeness it coincidental. Opponents to the anti-war protestors who wielded the peace symbol for the cause, if I recall correctly, attempted to denigrate the symbol over the runic connection. Why is there a cross under the Eifel Tower? The cross is due to the bottom arch of the Eiffel Tower intersecting with the vertical line of the peace symbol. Is the cross meant to signify anything religious? It’s not actually a cross cross. It’s the intersection of the vertical line of the peace symbol with the bottom arch of the Eiffel Tour. I always wondered what this symbol meant. As a child, it was probably the first symbol I ever contemplated. I think the fact that it came from the flag semafore language is super interesting. And OF COURSE people would try to link it to Satanism… what symbol isn’t, nowadays?